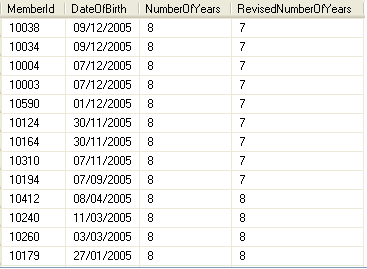 We have a column in a table named DateOfBirth datetime storing the Anniversary Date of a user. Lets assume it has the below data. We get the below output. 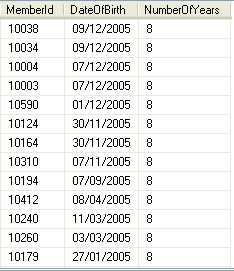 If you notice this output, you will find that the members having DOB as 9/12/2005 are treated as 8 years old but they are actually 7 years and some months as on this date. If you see the screenshot above, you will find that the RevisedNumberOfYears column displays the correct age of a member on the given date. I hope this post helps you. Please let me know your thoughts via comments.